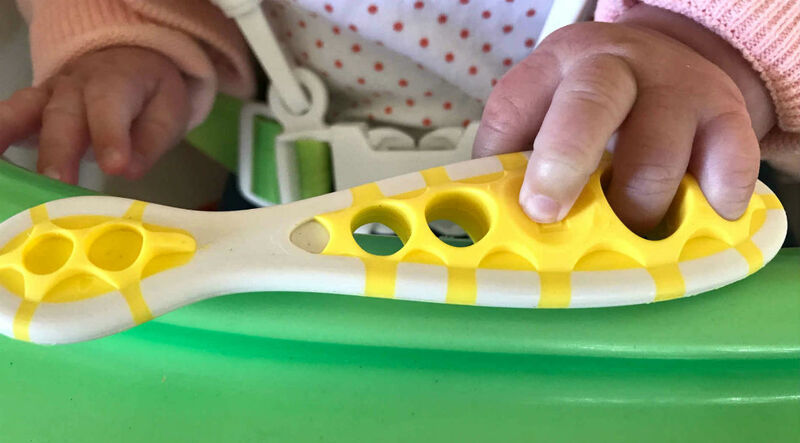 When you’re a parent knowing what baby cutlery to give to your mini muncher to help them master their table manners can be as confusing as putting together flat packed furniture (groan). I mean, when do you switch puree and BLW kids from fingers to spoons? And what’s easy for them to hold? Nodding? Fear not, here’s a guide on what cutlery you need for each weaning stage and how to get them comfortable using it. Yes, we know... we’re a cut above the rest. Ok, so, here’s how it goes. Many 6 month olds will probably be more interested in exploring their first tastes rather than holding any cutlery, and they probably aren’t yet developed enough to grasp the hand to mouth concept either. If they’re going down the Baby Led Weaning Stage, then at this point they’ll also be about their fingers too. Regardless of which route you choose to take, it’s never early to get them used to a spoon (because even BLW babes will need to learn how to eat cereal and soup at some point). So start them off in the right direction. Line up a couple of baby spoons to get them used to the idea, even if all they do is pick them up. Be sure to choose ones that are soft enough not to hurt little gums if they decide to bite down on them and won’t scold mouths if you’re feeding them, like these Munchkin White Hot Safety Spoons. Made of soft silicone, there’s four in a pack so you can give a few to bubs to hold. On the puree food journey? 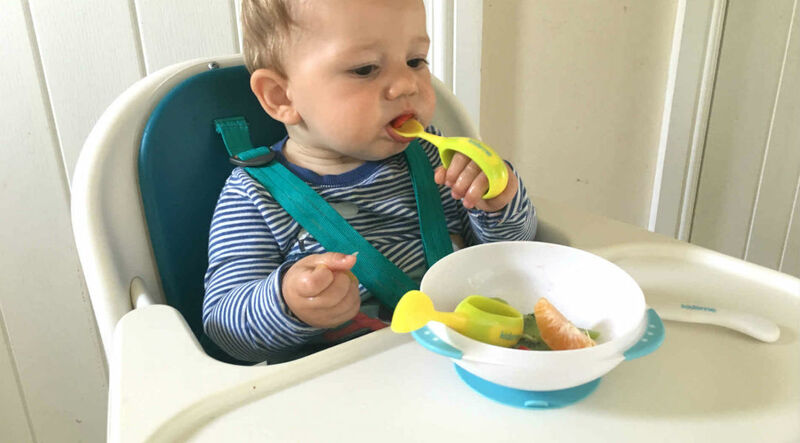 Stop frustrations of food falling off spoons when your baby hits the spoon to mouth stage (around 7 months) with these Cognikids Weaning Dip Spoons. Featuring a textured surface, which makes them simple for baby hands to hold, all they have to do is dip and the puree grips to the textured surface and find their mouths 😱. Cognikids Weaning Dip Spoons (£10). Psst, here’s a tip. Keep a ready supply of finger food to hand at this stage. That way you can keep them topped up and not starving, if they keep missing their mouths. Hangry food rage isn’t something to take lightly and can derail their progress. Ok, so they’ve successfully got comfy with a spoon - well at least the cereal’s going into their mouths (a lil’ bit). Now’s the time to bring out the big guns. Introducing the fork. Most toddlers will be able to have a go at this from around 16 months to two years old (my 17 month old can now stab her food with hers). However, they will also still dip in and out of using their fingers too - especially if using a fork proves to be too slow. Thankfully, there are some ways you can keep the spag bol covered fingers to a minimum. Just find a set that makes it easy peasy. This b.box First Cutlery Set features a fork that’s been ergonomically designed to fit the size and shape of little mouths, plus an angled handle to make stabbing food easier. Mini muncher still not getting it? This Kidsme Toddler Spoon and Fork Set may be your lifesaver. Featuring big handles, they’re easy for kids to grasp and keep hold of. Cool huh? Kidsme Toddler Spoon and Fork Set (£4). So they’ve been practicing with a fork and spoon, and finger eating has taken a backseat (phew), so it’s time to move onto the next stage... introducing them to the hard stuff. That’s right; It’s bye, bye plastic, hello stainless steel and kid-proof knives. We know it’s not easy getting them used to this, so keep their confidence high with this doddl 3 Piece Cutlery Set. Featuring ergonomically and intuitively designed handles, this set has been designed to encourage grip and also supports fine motor skill development. There’s also colourful stickers that can be used to guide little fingers. 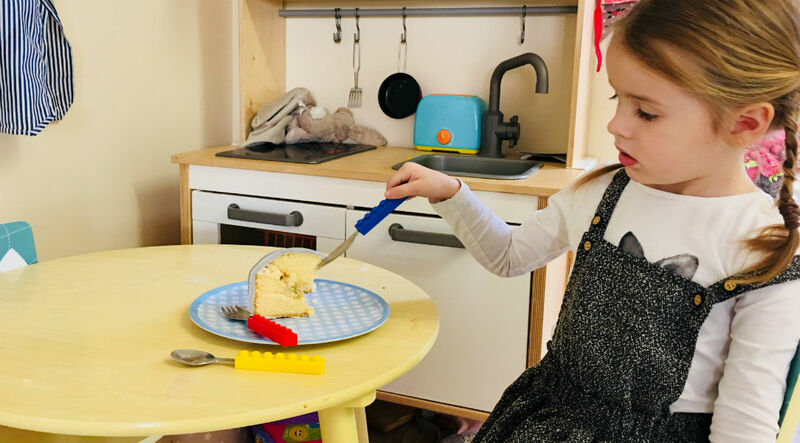 Oh, and when they’ve conquered that, give them a set to keep them eating with their knives and forks - and not their fingers - with this super cool Fred Snack n Stack cutlery set. Featuring a Lego stack design, it’s got fun written all over it. Awesome. Fred Snack n Stack cutlery set (£12). And here’s a little extra tip. Plates will slip when your pre-schooler’s trying to force that knife to cut, and from experience, this can cause tantrums. Stop plates and tears falling with a non-slip mat. It’ll be worth it. Promise. So there it is, the ultimate guide to cutlery for each stage. Good luck, and remember, they may not get it straight away, but eventually it’ll click. You just need patience, encouragement and wine 🤣.